Our washable air filters are great because they can be used repeatedly without having to be replaced. This reusable furnace filter just requires a quick wash when it has become dirty, which on average is every 3 months. If your home has pets, a required wash may be as often as every month to 2 months. The washable air filter is made out of natural fibers which allows for this product to be used over without damaging the product. The reusable furnace filter though can wear down over time depending on how often you are washing the product. The washable air filter comes in a few common sizes and is your standard 1" thick. Use the reusable furnace filter in most return filter grilles as well as in your HVAC ductwork. 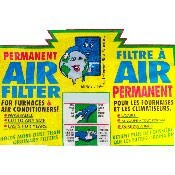 These washable air filters can also be cut down easily with sharp scissors to fit into any odd sized filter grilles. Our reusable furnace filters will catch about two and a half times more debris and dust than normal disposable filters because it is made with the natural material. When ordering reusable furnace filter, make sure to order according to your hole opening size since that is what will fit inside the grill frame. This washable air filter is sold separate from the grille but can be purchased with our return air filter grilles to save on shipping costs! Order this great product today and throw out your disposable filters for the last time!